Create a new light switch easily without pulling new wires or ripping through walls! Receiver is simply wired between power and light. Wiring is quick with included wire connectors and instructions. Switch controls receiver wirelessly. Mount the switch anywhere you want or use it as a portable remote. Controls halogen, incandescent, CFL, fluorescent, LED, ceiling fan, vents and other appliances with a maximum load of 1000W at 120V AC. A bonus to turn on light from your car when getting home. No more walking into a dark house. 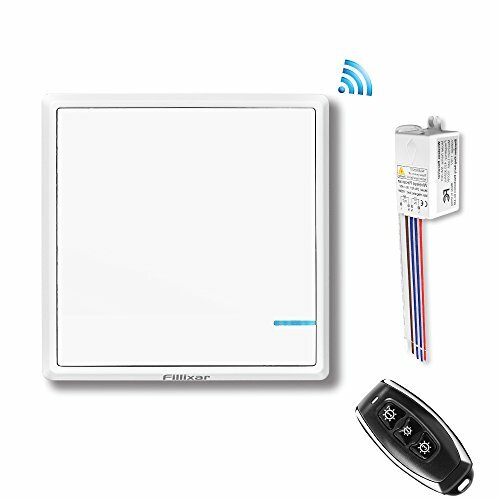 Switch, Remote Control and Receiver are shipped to you already linked together for a quicker installation. Switch is also designed to control multi receivers simultaneously, and one receiver can respond to up to 8 wireless switches. Remote range up to 160 feet in the house and 1000 feet in an open area, perfect for use on Garage, Staircase, Stairwell, Basement, House Entrance, etc. Safe to use in bathroom and porches, there is no electric leakage. Battery-Operated switch doesn't cause mechanical loss, your every each click works and you will not need to change batteries for up to 8 years.